Over the past few months there has been a lot of discussions online about how embedding the DLR (Dynamic Language Runtime) into your application opens up some amazing use cases. For example, Phil Haack recently wrote about how ASP.net MVC views can be stored in the database thanks for the DLR. Resolver Systems have been doing with with great success. Tonight, my latest article for Simple Talk was published. The article explains how I went about creating a new generator for SQL Data Generator which allows the user to define the data to be generated based on IronRuby code. I think this is an amazing use case, both for SQL Data Generator and the DLRIronRuby. By taking advantage of the DLR, we have opened up some extremely useful use-cases within the application. To find out more take a look at the article on Simple Talk. An example of the generator in action is shown in the screenshot. 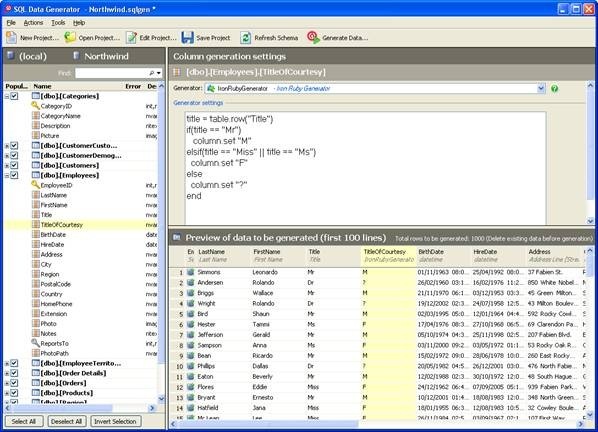 The article includes the source code and binaries for the SQL Data Generator example generator which you can start using within your project. NOTE: This Plug-in generator is provided ‘as-is’ and is completely unsupported.